Deciding to go mobile is a difficult decision for any business. Your company must weigh the pros and cons, as well as figure out a blue print to make that transition if you decide mobile is right for you. Below, we discuss the reasons for your B2B eCommerce website to go mobile and provide tips on how to make it happen. Is Being Mobile-Friendly Really Necessary? Should my B2B eCommerce company be going mobile? That question is becoming more frequently asked among the B2B eCommerce world. The answer? Yes! Within these last few years, mobile device usage has sky rocketed and has recently surpassed desktop usage. Did you know 4 out 5 smart phone users prefer to use their mobile devices over desktops to shop online? With the continued development and usage of mobile devices, it is important for your company to adapt with the times and become mobile-friendly. With the constant evolution of the B2B eCommerce world, it is important for your company to stay relevant and in the minds of customers. By creating a mobile website, you are ensuring your company will not be forgotten and you will be able to connect with and continue to grow your market. Every company’s goal is to be in the top ten organic search results. With Google’s new ranking system, having a non-mobile-friendly website may harm your website’s ranking. Websites that are compatible with mobile devices are being ranked higher, which will result in more website traffic via organic search. B2B eCommerce is beginning to reflect B2C eCommerce in that more research about products and services is happening on mobile devices. 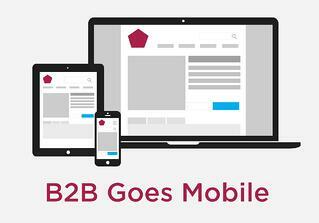 In fact, 56% of buyers buying from B2B eCommerce sites frequently use mobile phones to view the site. In addition, 40% of B2B buyers report that they will turn to a competitor after a bad mobile site experience and will be less likely to recommend that company to someone else. Mobile sites and apps allow for more tracking than desktop websites. An increase in customer tracking will allow your company to create a more personalized user experience. This customized experience will help in the process of nurturing leads and then turning those leads into customers. When constructing a mobile site, make sure to keep your site responsive. The site data and format should adjust and resize based on the browser your customer is using. A one second delay in mobile site loading time can lead to a 7% loss in conversion. The more adaptive the website, the better user experience. Mobile sites are mostly accessed on smart phones. Base the setup of your website around the thumb. Navigational buttons and links should be fitted for touch screens, not the mouse. Think “tapable” opposed to “clickable.” For example, a thumb cannot hover over a link like a mouse can. Test your mobile website! Make sure everything is formatted correctly. Videos and pictures should be highly pixilated so that they are clearly visible, text should be large enough to read without having to zoom in, and a chain of links should load seamlessly. Test your website often for flaws and regularly update the content to create an interactive user experience. Mobile websites and transactions are the next trend in the business world. The benefits of creating a mobile website for your B2B eCommerce organization are only continuing to cultivate. By creating a mobile-friendly website for your company you are keeping yourselves relevant and on the radar of future customers.